Type in हिंदी/Hindi (Devanagari Script) on your Android device. Type in हिंदी/Hindi (Devanagari Script) on your Android device. 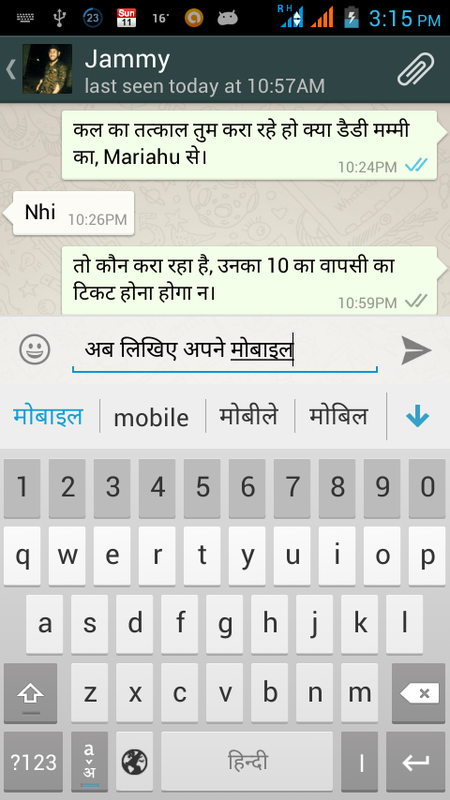 Using this you can write Hindi in SMS, WhatsApp, Facebook, Gmail, Viber, MS Office etc. in your Android device. Also you can search anything in your web browser, writing in Hindi (Devanagari Script), of which you want to know meaning or details. 1- Go to Google Play Store in your android phone. 2- Search for the application Google Hindi Input. • When you’ll get Google Hindi Input in search results in play store, click on this. • Now you’ll be on Google Hindi Input install page. Click on the Install button to install the app. Accept and give permission as asked for. • Once the download is complete, the application will install itself. Wait for the “successfully installed” status. Open Settings -> Language & Input, under “KEYBOARD & INPUT METHODS” section, check Google Hindi Input, then click Default and select “Hindi” in the “Choose input method” dialog. Go to Settings->Language & Input->Google Hindi Input->Keyboard, under “Select keyboard type” section, check the keyboard types you like. Methods to use this application Hindi transliteration – Toggle the button “a->अ” on English keyboard to turn on/off transliteration mode. – In the transliteration mode, you can type Hindi word in English characters and the app will convert them to Hindi. – For example, type “hindi” and then you will get the word हिंदी from a list. English – By turning off the transliteration mode on English keyboard (by pressing the button “a->अ” again), you can type in English. Hindi keyboard – Toggle the globe button to switch between English and Hindi keyboard – Vowels are changed to matra automatically after typing consonants. – Long press characters(vowels and consonants) to type variations of characters. For example, long press “ई” you can type “ई” or “ी”, long press “क” you can type क, कं, क्र or र्क.